Plants glabrous or moderately pubescent toward inflorescences, becoming glabrescent at maturity. Stems usually erect, green or sometimes reddish purple, branched, mainly in inflores-cences, to nearly simple, 0.3-1.5(-2) m, stiff. Leaves: petiole mostly equaling or longer than blade; blade rhombic-ovate to broadly lanceolate, 4-8 × 2-3 cm, occasionally larger in robust plants, base cuneate to broadly cuneate, margins entire, apex cuneate to obtuse or indistinctly emarginate, with mucro. Inflorescences mostly terminal, usually with spikes at distal axils, erect and rigid, green to silvery green, occasionally tinged red, leafless at least distally. Bracts lanceolate to linear-subulate, 4-7 mm, 2-3 times as long as tepals, rigid. 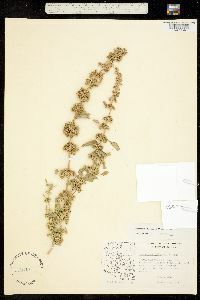 Pistillate flowers: tepals usually 3-5, not clawed, unequal; outer tepals narrowly ovate-elliptic or elliptic, 1.5-3.5 mm, apex aristate; style branches spreading, shorter than body of fruit; stigmas 3. Staminate flowers clustered at tips of inflorescence branches; tepals 3-5; stamens 3-5. Utricles subglobose or compressed-ovoid, 2-3 mm, equaling or shorter than tepals, smooth or lid slightly rugose or minutely verrucose, dehiscence regularly circumscissile. Seeds black, subglobose to lenticular, 1-1.4 mm diam., smooth, shiny. Flowering summer-fall. Disturbed habitats, agricultural fields, railroads, roadsides, waste areas, banks of rivers, lakes, and streams; 0-2500 m; Alta., B.C., Ont., P.E.I., Que., Sask. ; Ariz., Ark., Calif., Colo., Conn., Fla., Idaho, Ill., Ind., Kans., Ky., La., Maine, Mass., Mich., Minn., Miss., Mo., Mont., Nev., N.H., N.J., N.Mex., N.Y., N.C., Ohio, Okla., Oreg., Pa., R.I., S.C., S.Dak., Tenn., Tex., Utah, Vt., Va., Wash., W.Va., Wis., Wyo. ; Mexico; introduced or naturalized in South America, Eurasia, Australia. 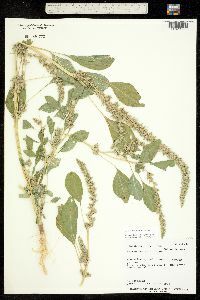 Amaranthus powellii is originally native to southwestern United States and adjacent regions of Mexico; now, it is widely naturalized almost everywhere in temperate regions of North America. The distribution of A. powellii is probably underestimated both in North America and the Old World, and literature references are somewhat confusing, because A. powellii has been commonly confused with A. hybridus. Duration: Annual Nativity: Native Lifeform: Forb/Herb General: Annual herb, glabrous or moderately pubescent toward inflorescences, becoming glabrescent at maturity; stems usually erect, green or sometimes reddish purple, stiff, branched, 30-150 cm. Leaves: Alternate and petiolate, the petiole equaling or longer than blade; blade rhombic-ovate to broadly lanceolate, 4-8 cm by 2-3 cm, occasionally larger in robust plants, with a cuneate base, entire margin, and mucronate tip. Flowers: Green to silvery green, occasionally tinged red, in terminal and axillary spikes; spikes erect and rigid, composed of small clusters of flowers subtended by rigid, lanceolate to linear-subulate bracts, those 4-7 mm, 2-3 times as long as tepals. Pistillate flowers have 3-5 tepals, those unequal, not clawed, the outer tepals narrowly ovate-elliptic or elliptic, 1.5-3.5 mm, with an aristate apex. Staminate flowers clustered at tips of inflorescence branches, with 3-5 tepals and 3-5 stamens. Fruits: Subglobose or compressed-ovoid utricles, 2-3 mm, equaling or shorter than tepals, smooth or the lid slightly rugose, with circumscissile dehiscence; seeds black, subglobose to lenticular, 1-1.4 mm in diameter, smooth and shiny. Ecology: Found in disturbed areas along fields, roads, and banks of rivers, streams, and lakes from 3,000-8,000 ft (914-2438 m); flowers summer and fall. Distribution: Originally native to the southwestern US and northern Mexico, now ranges throughout the US intermountain west and generally throughout the world. Notes: Regularly confused with the quite similar A. hybridus. Both species are monoeceous (male and female flowers on the same plant) annuals with ovate-lanceolate leaves and axillary and terminal inflorescences. 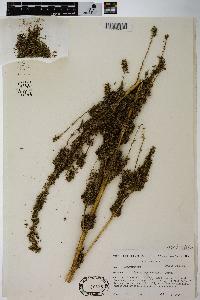 The key differences are that A powellii has stiff, stout, erect inflorescences with bracts 4-7 mm; A. hybridus has soft, lax inflorescences with spreading branches (when branches are present) and bracts 2-4 mm. 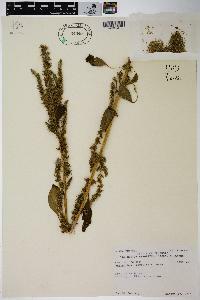 Also appears similar to A. palmeri, but that species is dioeceous (male and female flowers on separate plants) and has only terminal inflorescences, which are notably narrower than the other two species, with the top portion nodding or drooping. A. palmeri sometimes has glomerules of flowers in the leaf axils, but these are quite small and certainly do not constitute an entire inflorescence, as is found in the leaf axils of A. powellii and A. hybridus. 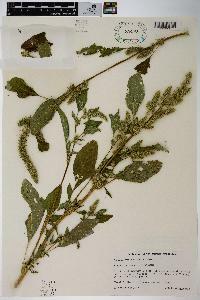 Ethnobotany: The seeds were used as a grain and the leaves were used as greens. 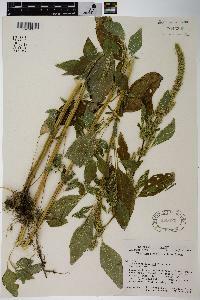 Synonyms: Amaranthus bouchonii, Amaranthus bracteosus, Amaranthus retroflexus var. powellii, Amaranthus viscidulus Editor: SBuckley 2010, AHazelton 2015 Etymology: Amaranthus comes from the Greek amarantos, "unfading," referring to the long-lasting flowers, while powellii is named for John Wesley Powell (1834-1902) the famous explorer of the Colorado River and the Grand Canyon. Monoecious, to 2 m, freely branched, puberulent to villous in the infl, otherwise glabrous or puberulent; lvs long-petioled, lance-ovate to deltoid-elliptic, to 10( 15) cm in well developed plants, glabrous or nearly so; infl terminal, stiff, dense and spike-like, unbranched or with a few widely spaced long branches, dull greenish, not showy; bracts ca 5 mm, much surpassing the sep and frs, with a very thick, excurrent midrib; sep 3-5, with simple midvein, those of the pistillate fls sharply acute, nearly straight, unequal, 2-3(-3.5) mm, the longer (outer) ones generally surpassing the fr; stamens as many as the sep; style-branches elongate, recurved from the thickened base; fr slightly rugose, circumscissile; seed dark brown, suborbicular, 1-1.3 mm; 2n=34. Native to open habitats in w. N. and S. 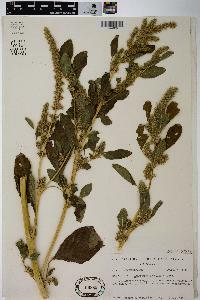 Amer., now a common weed in w. U.S., and becoming established in our range.